A dinner in 30 minutes, I am a simple girl and these are what make me happy. 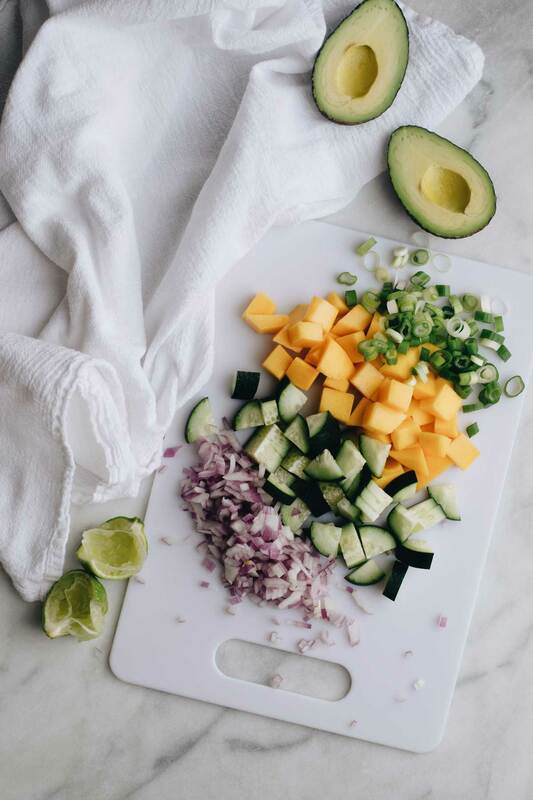 Mexican spice, cornbread, fresh ingredients. This is a meal for me. I like homemade cornbreads, but honestly the various inexpensively available box mixes of the world a very good and most of the time I just do those. MEXICAN IN ALL FORMS! Another way to get a taco-esque experience to my mouth. Cook turkey in a large skillet over medium heat. When almost no pink remains, strain liquid from pan and add taco seasoning. 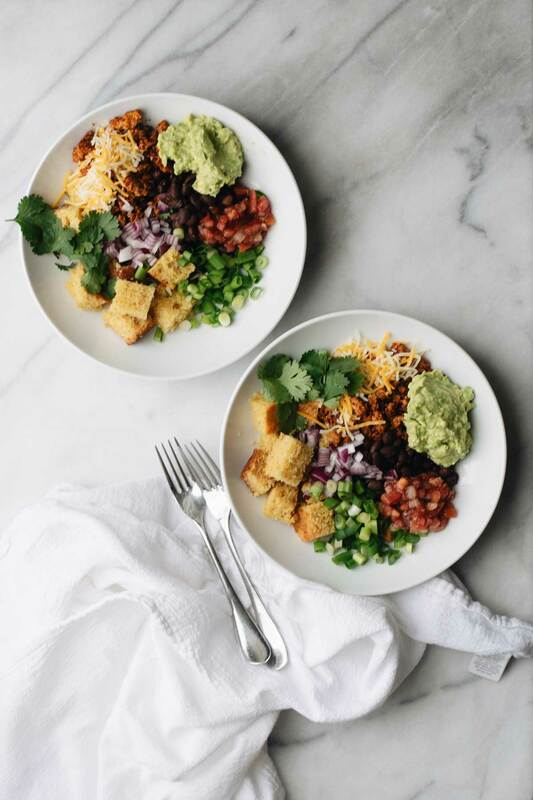 Assemble taco bowls with cornbread, ground turkey, black beans, red onion, green onion, cheddar jack cheese, avocado, salsa, and cilantro. Salads are an all time favorite food of mine, and I always have my wheels turning for versions that don’t have tender lettuces. 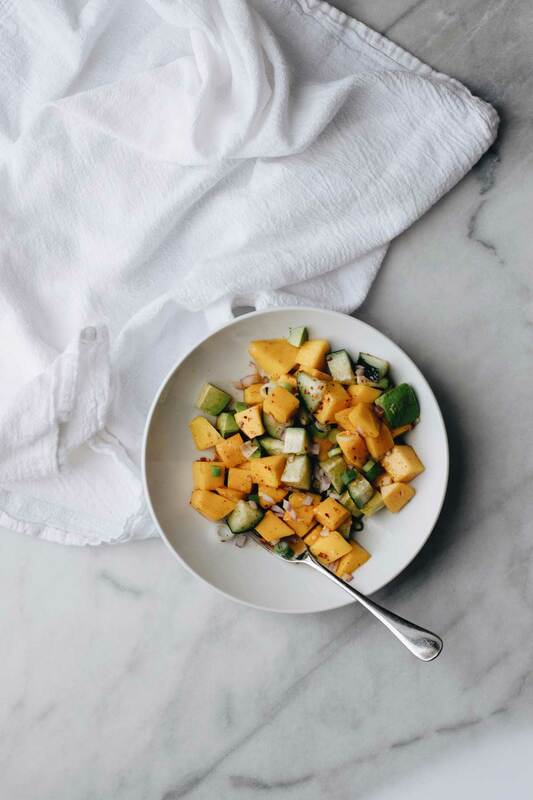 Ones with heartier bases like, beans, kale, and here – mango, hold up well when prepped in advance. Also increasingly I am sometimes becoming dissatisfied with storebought dressings and am frequently just making my own. It’s kind of always surprising how good dressings can taste with simple ingredients and this spicy honey one is VERY QUICK to whisk up in a bowl. 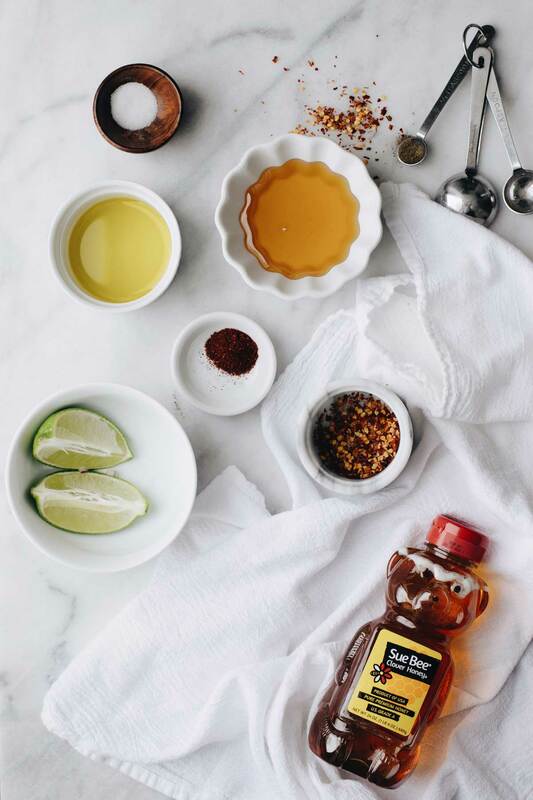 For this recipe I used sioux honey – pure honey, with nothing added, made in the usa by family beekeepers who care about making trustworthy honey. Whisk together olive oil, honey, lime juice, chili powder, pepper, red pepper flake, and salt. 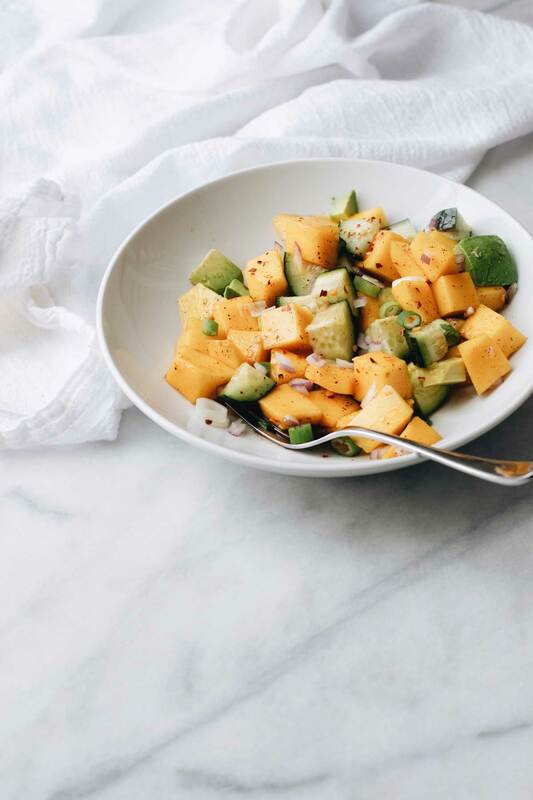 Toss mango, red onion, cucumber, and avocado with dressing. Top with green onion. It is incredible to me how much this diy changed the room! I think it is my favorite project I have ever done, at least up there in the top five. It was quite fast and made a huge impact. 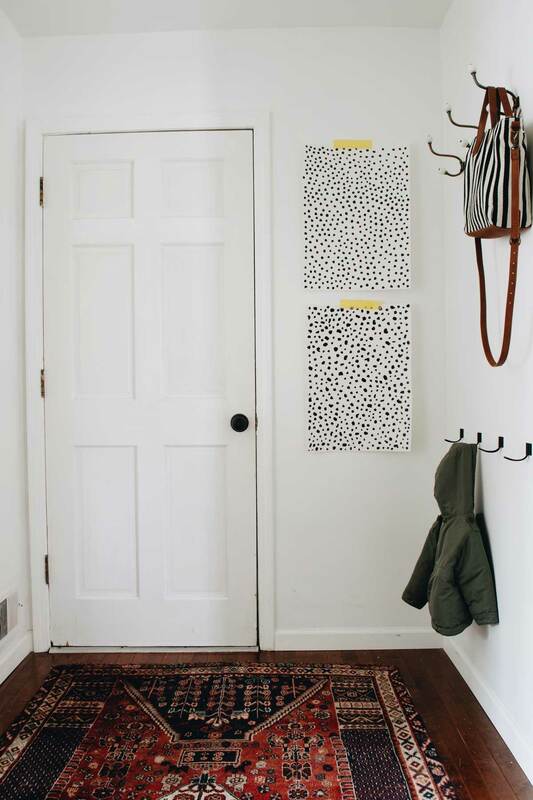 Black and white speckled is one of my all-time favorite prints. It feels a touch glam and looks good with almost everything. At the same time of this project I painted our door black and it also makes the room significantly better. I painted the trim black too without really thinking, and I wondered if I wanted it back white. But for now I am keeping it. I took a poll on instagram stories and everyone was very split on white or black for the trim. 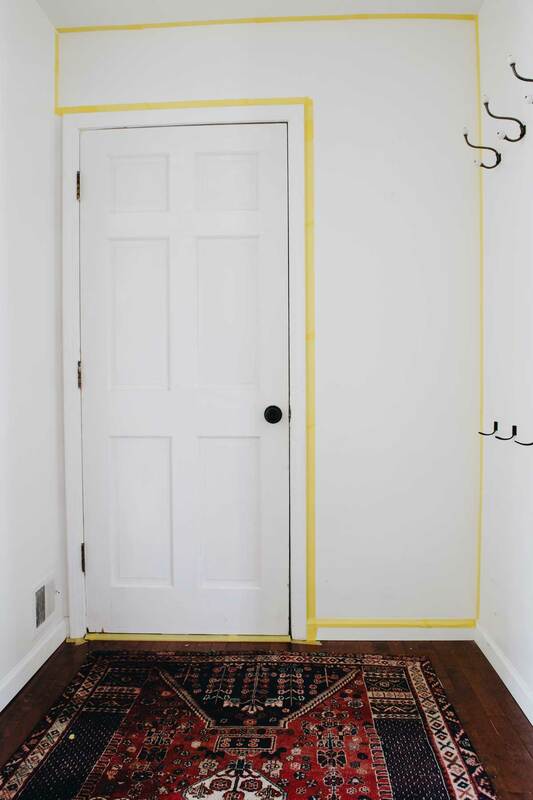 On the wall first is a crisp white coat of behr “ultra pure white.” I used frogtape’s yellow delicate surface tape because it is safe to put on wood floors or freshly painted surfaces (not yet fully cured). Also sharp lines! 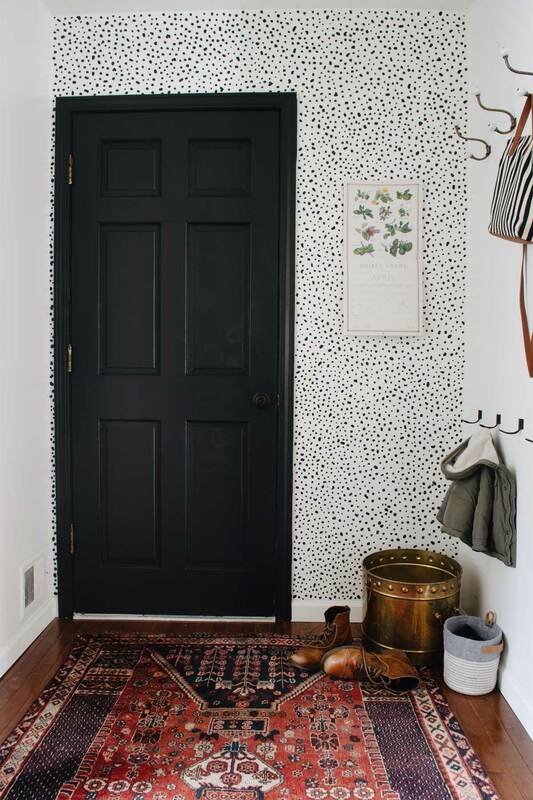 The black color is benjamin moore “onyx” and it is a great black for doors. 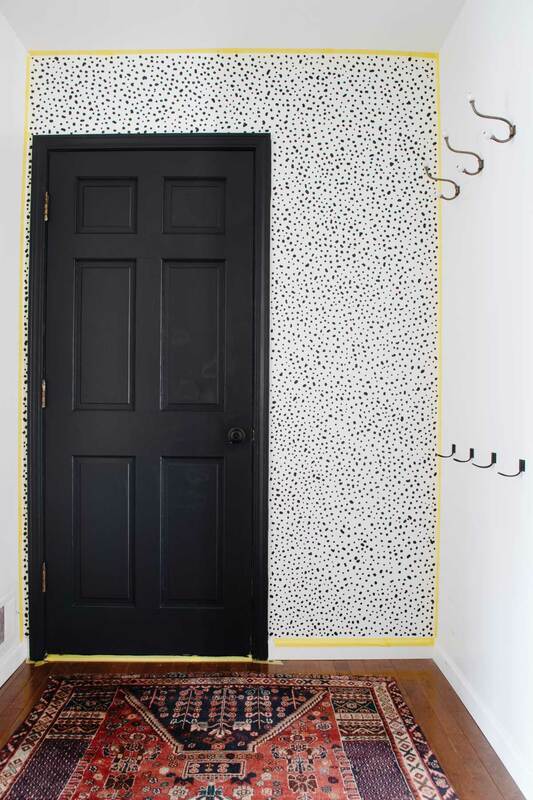 I did an eggshell sheen on the door because I wanted to use the same paint for the dots and my walls are eggshell. Before painting my print onto the wall, I experimented on poster board with two different looks. The top is a more uniform polka dots and the bottom is a more varied speckled. I liked both, but maybe speckled a bit better. And David preferred the speckled too. 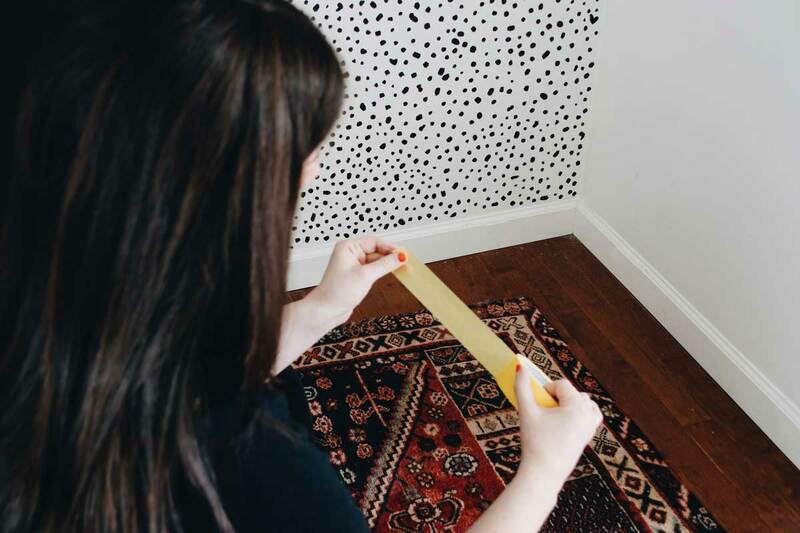 Start with a clean and dry surface on your wall. For my white background, I used behr “ultra pure white” in eggshell. Tape off border using delicate surface frogtape. Hand paint speckles with a small brush. There’s a video saved in my instagram highlights of me doing mine. Doing the dots on my wall took two and a half hours, plus a little bit for touch ups. It was an easy project to tackle in a day. I put our farmer’s market calendar back up and love it with the print. Although I think so many different types of art and colors would look good with this background. 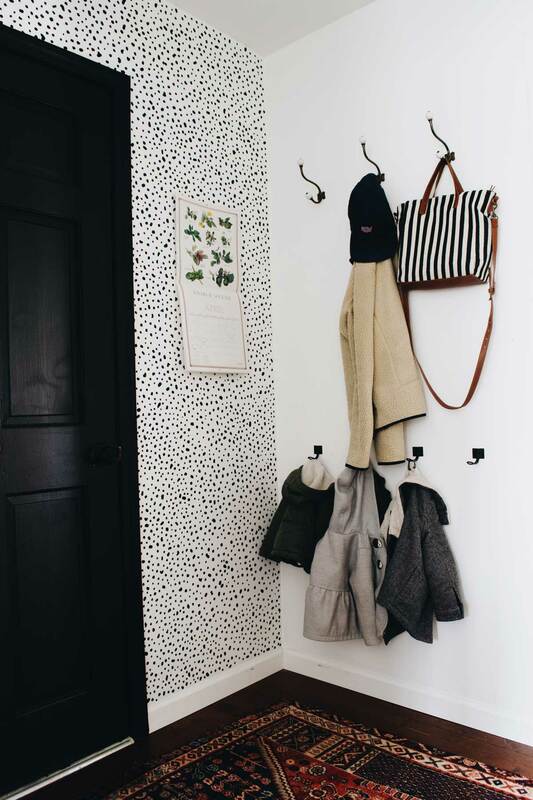 We are loving spring for MANY reasons, but one thing I like so much is having less big coats we need to pile on our hooks! Our mudroom feels brand new with such a small, very inexpensive project. Only about $20 and three hours time!